Meeting with some of the teachers over lunch the other day in the cafeteria, we somehow got to talking about cannibalism — perhaps it was the frigid Astana winters? 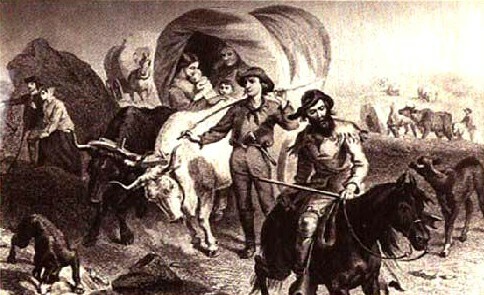 Did the words Donner party come up? “Whenever I eat doner kebabs, that’s what I think of — cannibalism!” Ben grins. He’s eating chicken while I pick through tepid meat and potatoes. My local colleague Arslan and I exchange glances — it all tastes different now! I’m a little alarmed, but Arslan just sips his tea and smiles. He likes telling stories, and claims this happened “all the time” under communism. “People in the wilderness, they’d just come back a few guys short, you know?” He claims that under the 900-day German siege in World War II, Leningrad had over 800 documented cases of cannibalism, as the Army rounded up and requisitioned whole families for food. And then he gets to telling us about his “grandfather” in early Soviet times, who rode across the steppe on a horse avoiding cannibals. “He was a comsomol guy, and set out from a village for work,” Arslan tells us, “and as he rode, people come out from the villages with knives and sticks, to eat him…” Mimicking a zombie staggering across the lunchroom, Arslan assures us that the poor villagers were indeed cannibals, but so slow and malnourished that they couldn’t catch his valiant grandfather. I may not quite believe him, but it’s good to be sitting and talking with Arslan in the same room. When I first moved here, local staff weren’t allowed to eat with foreign staff in the faculty lunchroom, and were instead instructed to sit out with the students in the main lunchroom. After some protests, the “apartheid” was lifted and Kazakhs were permitted to eat with us Americans and Brits. Of course there are still some class divisions. We already covered how I get to take all my vacay, and to work *only* 40 hours a week while my colleagues work 50. I tell this to Ben with a grin. He groans. “This has to stop.” It’s the same in their department — foreigners can leave at 6:30, but Arslan is supposed to work late into the night. An amazing guy with research experience and a western master’s, Arslan’s just like me, hired as a local “manager” for just over $1000/month. The teaching faculty, on the other hand, seem to get $60,000 to $90,000 a year, paid airfare and relocation costs, the best apartments in town, private-school tuition for their children, medical insurance, and up to $20K in research grants. Which they don’t have time to use because they teach so much, but I suppose that’s another story. At any rate, that’s a huge divide. Arslan’s excited to return to school for another degree soon, but Ben jokes with him that he’ll still be treated the same way when he returns as fully faculty — because he’s local. “Why are you not at work?,” Ben mimes, cracking a whip and checking an absent-box on an invisible schedule. It’s kind of funny, and really not.